This is a Goldilocks story. I was looking for something to make for a weekend dinner that would be kind of a special meal. I had just finished reading, and cooking a few other things from, the brand new Barefoot Contessa Foolproof book. 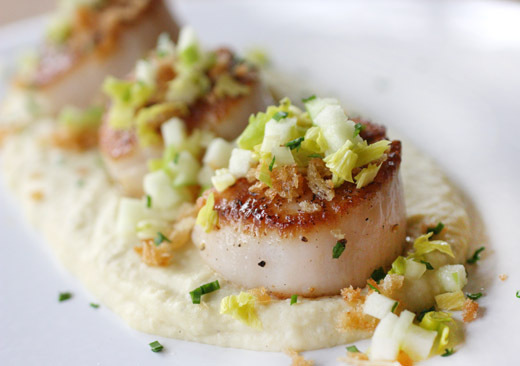 In it, there’s a Seared Scallops and Potato Celery Root Puree dish that sounded delicious. Even though the dish seemed perfectly lovely, I wanted something just slightly more dressed up, more special, more this-isn’t-your-usual-weekend-dinner-at-home. A few days later I was flipping through Stir: Mixing It Up in the Italian Tradition which is full of great ideas and has never disappointed. There, I found a very similar dish called Scallop and Pureed Celery Root Gratinee. This was a dolled up version of the same thing with just a few differences. It was topped with crispy breadcrumbs, finely diced Granny Smith apple, and a celery emulsion. It was beautiful in the photo. But, I realized I didn’t really want to fuss with a celery foam. I can be hard to please. I picked my favorite parts of each dish from both books, and voila. I went with Ina’s version of the puree which included leeks and potato and was cooked in cream. Then, after pureeing it, I pushed it through a fine-mesh strainer just like Barbara Lynch suggested for a velvety smooth finish. I topped the seared scallops with buttery breadcrumbs and diced apple as shown in Stir, but instead of a celery foam, I used finely diced celery. The last detail was Ina’s drizzle of olive oil. And, dinner was just right. This is what the cooking entailed: Chopped leeks were sauteed in butter, and diced peeled potato and celery root were added along with cream and salt and pepper. I used two and half tablespoons of butter, two chopped leeks, two Yukon gold potatoes, one celery root, and one and a half cups of cream. This was brought to a boil and left to simmer for about 25 minutes until the potatoes and celery root were very tender. The cooked vegetables and cream were transferred to a food processor and pureed until smooth. Then, I scooped the puree into a fine-mesh strainer and pushed it through using a metal spoon. The strained puree was kept warm in a saucepan over low heat. The scallops were patted dry, seasoned with salt and black pepper, and seared in grape seed oil over medium-high heat for about three minutes per side. To top the scallops, panko breadcrumbs were toasted in melted butter, Granny Smith apple and celery were finely diced, and chives were chopped. Once plated, Ina recommends drizzling the scallops with basil oil, but I used a plain, extra virgin olive oil. I never would have thought to pair Granny Smith apple with scallops, but it was a fantastic idea. The tartness of the apple functioned just as a squeeze of lemon would but added a little crunchiness as well. During dinner, we argued as to whether the apple, celery, and breadcrumb toppings were better with the scallops or the potato and celery root puree. They were great with both, and I wouldn’t change a thing when I make this again. A beautiful dish and combination! What awesome flavors. What a luxurious and beautiful way to serve scallops. They are perfectly browned without shrinking too. Votes for that topping going best with the scallops! They have such a great crust. That tender bit of seafood would go well with the topping. What an exquisite le beautiful way of serving scallops! I love how you combined the two recipes. Scallops are a special favourite but too expensive to eat too often. The finished dish certainly does look JUST.RIGHT. And gorgeous! So perfect for a dinner party! What a beautiful sear on those scallops. I've never had celery rood puree and have seen it many times. I think it sounds delicious. Love that apple on the scallops. I'm glad to hear you wouldn't change a thing about this recipe. I've got to try it. Great way to combine two recipes and make one that's even better! Scallops are one of my wife's absolutely favorite things to eat, so we have them often. And I've never paired them with Granny Smith apples - I'm intrigued by the idea. Really a nice recipe - thanks so much. Scallops are such a special treat and deserving of star billing whenever they are prepared. Your weekend dinner is so divine, well done! I eat a lot of celery root, never cooked it, but I am willing to try it. Thanks Lisa! while i don't dig scallops, your presentation is lovely and i find the apple component really appealing! Wow Lisa, such a beautiful and tasty combination...love how your scallops look...perfectly golden. They look absolutely perfect Lisa. What a great recipe. Tyler would love these. Whenever we go out and he orders scallops it's pretty disappointing! What a lovely and fancy meal! Looks like a restaurant! Scallops are one of my favorite special treats. Lisa this is so elegant! I love the styling. 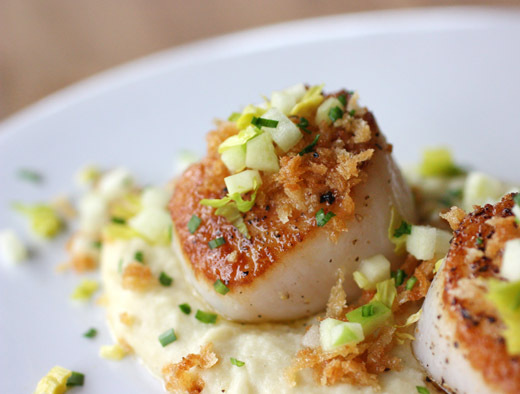 Scallops are my current obsession, but celery root? I think I need to try it. I love how those scallops just pop right off the page. How gorgeous! I've only cooked them a few times, but now that I have more access to seafood I can't to try more recipes. What an elegant presentation! The scallops look nicely cooked. 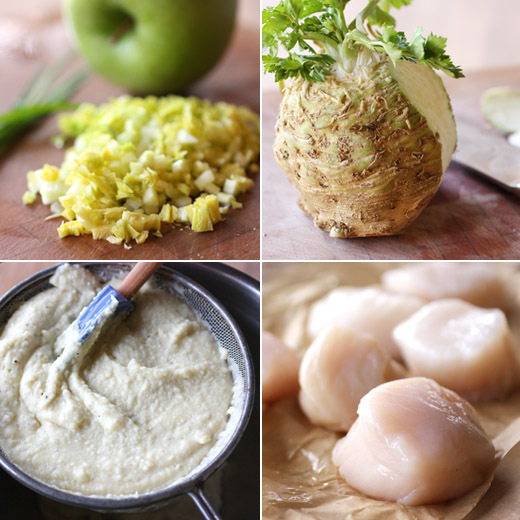 I would love to try this apple, celery and scallops combination. I've been posting sea scallops lately too. Your recipe sounds superb!